Michael Collins Persse, who has died aged 86, was the Australian schoolmaster assigned to watch over Prince Charles during the two terms he spent at Geelong Grammar School in Victoria in 1966. It was a vital experience, liberating the prince from the chilly regime of Gordonstoun School which he is said to have described as "Colditz in skirts", and also the start of a close friendship nurtured by letters and personal meetings over more than 50 years. Collins Persse attended the Prince's investiture as Prince of Wales at Caernarvon Castle in 1969, his marriage to Lady Diana Spencer at St Paul's Cathedral in 1981 and his 50th birthday party at Buckingham Palace in 1998. Later the Prince declared that his friend had become the guardian of so much wisdom and collective memory at the school that "he must surely qualify as a National Treasure". Collins Persse only occasionally featured in the Australian press, and almost never in the British. But when the popular press steadily turned against the Prince after Diana, Princess of Wales, died in a car crash in 1997 he wrote a passionate letter to The Daily Telegraph pointing out that the Prince had "suffered greatly when his marriage broke up before the media's unrelenting gaze" and the Princess's death "can only have made this hurt so much worse". Collins Persse went on to enumerate the Prince's many virtues, talents and achievements. "All this - and more - amounts to something rare and precious," the letter concluded. "We have in him a remarkable human being, a true prince for our times who is a monarch in waiting with rare qualities of mind and heart. He needs and deserves strong support." The letter helped to soften the public mood, persuading some of the tabloids to call off their attack dogs. Michael Dudley de Burgh Persse was born on November 10, 1931 into a long-established Irish-Australian family and brought up on the family cattle station at Toowoomba, Queensland, which his father ran - apart from two years in Co Galway when he served as Master of the Galway Blazers hunt. In 1971, Michael would change his name by deed poll to Michael Dudley de Burgh Collins Persse - Collins being his mother's maiden name. Young Michael taught himself to read with Lewis Carroll's books and as a boy spent a few days on holiday at Windsor Castle where his cousin, the Earl of Gowrie, VC, was the governor. He was educated at the King's School, Parramatta, before going up to Balliol College, Oxford, to read history, staying on to read theology, with the intention of being ordained into the Anglican Church. His closest friendship at Oxford was with Sir Andrew Hills, a scruffy yet elegant Catholic baronet with a brilliant, but occasionally troubled mind. For seven months they were close, reading together, travelling abroad and staying up into the small hours debating the divide between Anglicanism and Roman Catholicism. But their friendship came to an abrupt end when, after a hard night's drinking, Andrew Hills fell under a bus near the Martyrs' Memorial and was killed, aged just 21. He was said to have been on his way to confession. Stricken with grief, Collins Persse drew comfort from In Memoriam, Tennyson's poem about his lost friend Arthur Hallam. He abandoned his plan to seek ordination, turning down an invitation to join the teaching staff at Eton before returning home in 1955 to Australia to teach English and history at Geelong. Collins Persse began as a house tutor and was soon appointed head of history. One of his first projects was to produce a pageant for the school's centenary Their Succeeding Race, which had a cast of 150 and linked the history of the school and Australia to God's purpose. He became keeper of the archives then editor of the school magazine, The Corian, which was described by the Royal Historical Society of Victoria as "surely the most idiosyncratic and eccentric school publication in the land". His devotion to the close relationship between Britain and Australia made him an ideal choice to supervise the nervous young prince who arrived in Australia to continue his education. Charles spent part of his time at Geelong, being tutored for A-level history by Collins Persse, who recognised his pupil's unique perception of the pressures experienced by such unfortunate monarchs as Charles I and Louis XVI. It was, however, on outings to Timbertop, the school's mountain retreat, that the young prince began to develop leadership qualities. On 70-mile hikes and night treks, he encountered leeches, snakes and funnel-web spiders and would return exhausted with bleeding feet, to be teased by fellow pupils as "a Pommie b*****d". Yet, after three weeks, he decided to stay another term, and when he paid a return visit in 2005, he recalled his time at the school as one of the happiest periods of his life. In all, Collins Persse reckoned that he had taught and mentored at least 10,000 pupils. When the novelist Peter Carey won his first Booker Prize in 1988 he was uneasy until he consulted his mark book which showed that Carey had been the one pupil in his English class to whom he had awarded As for his essays throughout the year. Known to pupils as "Mr Colly Persse", Collins Persse formally gave up full-time teaching in 1993 but remained as the school's curator. He was so much part of Geelong that he was granted a permanent flat called the Dovecote and had a library for his 30,000 books specially built for him. In his later years, Collins Persse wrote several books. Well-Ordered Liberty (1995) was a portrait of the school. In the Light of Eternity (2011) contained essays, verse and newspaper obituaries. 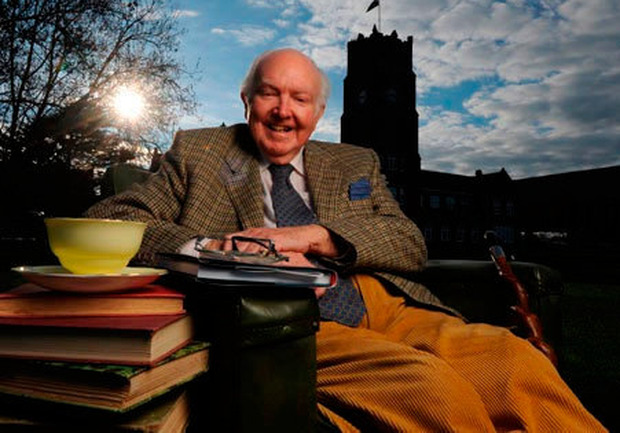 But his most heartfelt work was Scholar Gipsy (2012), in which he told the story of his friendship with Andrew Hills who had remained "always at heart, sometimes in mind" throughout the years after his untimely death. He felt it necessary to declare that there had been no homosexual element in their relationship; the book also included an account of his own subsequent life. Michael Collins Persse, died on June 25.